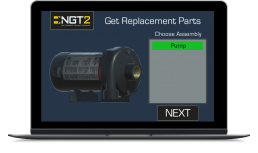 NGT2’s Interactive Part Ordering applciation simplifies the part ordering process by making it visual. Instead of manually entering the code in to an order form, simply open the app, choose the equipment, and click on the part from a realistic 3D model to generate the order. Simplifying the parts-ordering process by making it visual and interactive means an improved buying experience for customers and improved productivity for parts sales and the supply chain. Field service engineers can quickly and easily order parts and stay focused on completing the task at hand. Automate orders by integrating the app to your current system or ERP. An exploded view of an equipment’s parts ensures the correct selection when checking out.